I mentioned in previous posts and on my about page that I used to really dislike carrots. I’m not sure what it was but the more raw and hard the carrots were, the more I disliked them. “Carrots are good for your eyesight, you should eat them” my mum always told me. “If you don’t like them, you can give them to me!” my brother would say after. Unlike me, my brother absolutely loves carrots. However, I find that in recently years, my tastes have started to evolve. It’s like as if I’m undergoing puberty again, only for my tastebuds. I’m no longer disliking carrots like I used to, in fact I’d gladly eat them along with a good piece of steak or in a rich stew. I wouldn’t be able to eat Vietnamese rolls (bahn mi) without the zingy pickled carrots nor could I eat Japanese curries without the chunks of beautiful soft carrots. I’ve even started ordering beers when I’m out and would raise my hand when someone asked “anyone up for a beer?” even though I totally hated the taste of beer before. And I totally mean H.A.T.E.D. Maybe age is getting to me. Last Saturday, I accidentally got the date wrong for a farmer’s market that I wanted to go to to buy Summer Snow apple juice (it’s so refreshing and delicious). Since we were already out, Yuye decided to drive to the nearest supermarket that had the apple juice in stock. We eventually reached our destination and was surprised to find a small farmer’s market just across the road. Although it was small, we managed to bring back a few bunches of beautiful baby (Dutch) carrots. A few years ago, this would have been unthinkable. Even though we didn’t buy the apple juice I was after (it was so expensive it wasn’t worth it) we were still happy that we got something out of the trip. 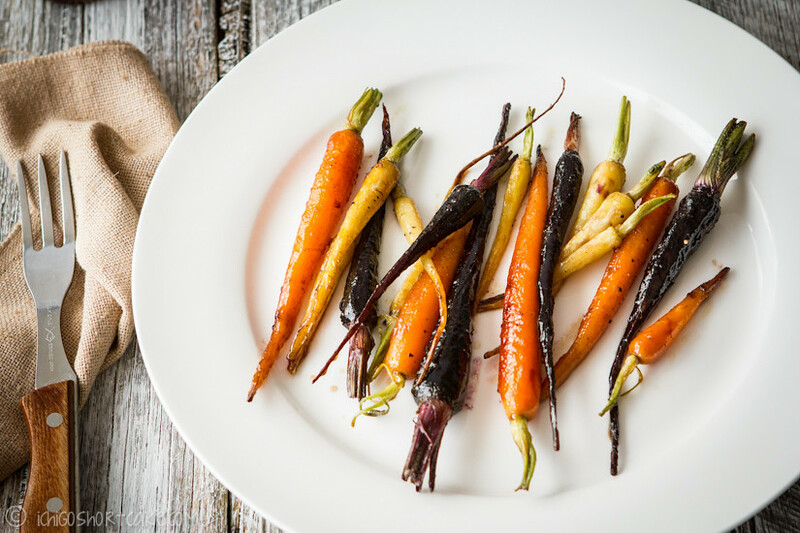 Making these carrots in just one way seemed boring since we had so many so I decided to make them 3 ways. We had made them with roughly 1 bunch of Dutch carrots each, but in the recipe I have adjusted for 2 servings so you can make whichever type suits your taste as a side dish to a main. They are all very easy and don’t require many ingredients. 1. Heat frying pan to medium high, melt butter on the pan, careful to not burn it by constantly swirling it around the pan. 2. Once the butter is melted, put in carrots. Turn the carrots so they are evenly coated in the butter. 4. Cook the carrots until slightly browned and cooked through, roughly 10-15 minutes or longer if your carrots are large. 5. 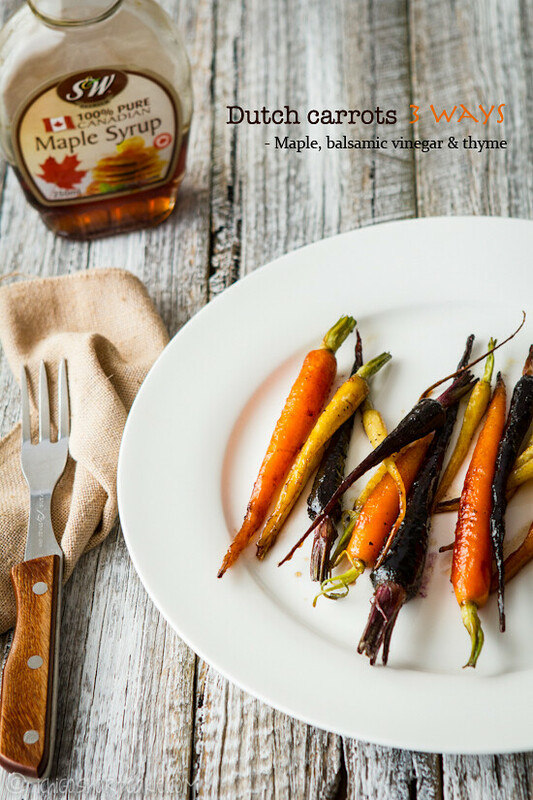 Pour on maple syrup and quickly toss the carrots to coat them. Take off heat immediately and serve while hot. Note: I didn’t make it myself but I believe this recipe would go very well with some ground cinnamon or even sautéing it with some bacon. It would also work very well if you change the maple syrup to honey. 2. Mix balsamic vinegar, olive oil and brown sugar in a bowl and mix well. Pour mixture over carrots in a baking tray. 3. Add salt and pepper to taste then bake for roughly 20 minutes, or until browned and just slightly shrivelled. Serve immediately. 2. Melt butter in the microwave, careful not to burn it. 3. Put carrots in a oven tray, pour butter over carrots. Coat them evenly. 4. Spread on chopped garlic and add salt and pepper to taste. 5. Bake carrots for roughly 20 minutes or until browned and just slightly shrivelled. Serve immediately. My favourite would have to be the maple syrup recipe. It was so delicately sweet and buttery and brings out the natural sweetness of the carrots. Although the tops of the baked carrots were crunchy enough to eat where the pan fried ones weren’t. Yuye’s oven is tiny by the way. I bought a portable oven for him last year because his one was broken so it can only fit a few things in at a time. That’s why I had to cook the carrots on the one tray, separated by a few halved cocktail potatoes. I served these beautiful carrots and potatoes with a porterhouse steak, which I will post up the recipe for in a later post! Question time: How do you like to eat your carrots? Which recipe above would you like more with a steak? These look absolutely beautiful! I’ve never been a massive fan of carrots. Raw they’re ok, but cooked always seems a bit boring, so it’s nice to jazz them up in some way and this seems fantastic. I’ve never seen the dark carrots before… how cool are they? Do you know what they’re called (the variety, I mean)… I’ll have to keep my eyes open for those! By the way – it’s personal preference I guess, but when I do prepare baby carrots I never peel them… they seem too small and delicate and I think that the outer layer has a lot of rich, earthy flavour. As long as they’re not pesticide-ridden or super dirty I just give them a really good scrub with a clean scouring pad :). I have no idea what the purple ones were called actually…the people I bought them from just said purple Dutch carrots so maybe that’s just what they’re called? I bet these were sweet and delicious with that bit of maple syrup! Oh my goodness, Jenny, your photography is stunning! Not many can make carrots look so gorgeous! I’m loving the maple syrup glazed carrots! I’ve candied them before, but never with maple syrup – will definitely try it! Oh, yes indeed! I’m lovin’ on maple syrup (I have the same bottle/brand in my fridge) and roasted veggies right now. I would like all of this. Please may I have some carrots? Gosh these look fantastic!! i love carrots that would be a great recipe for me. 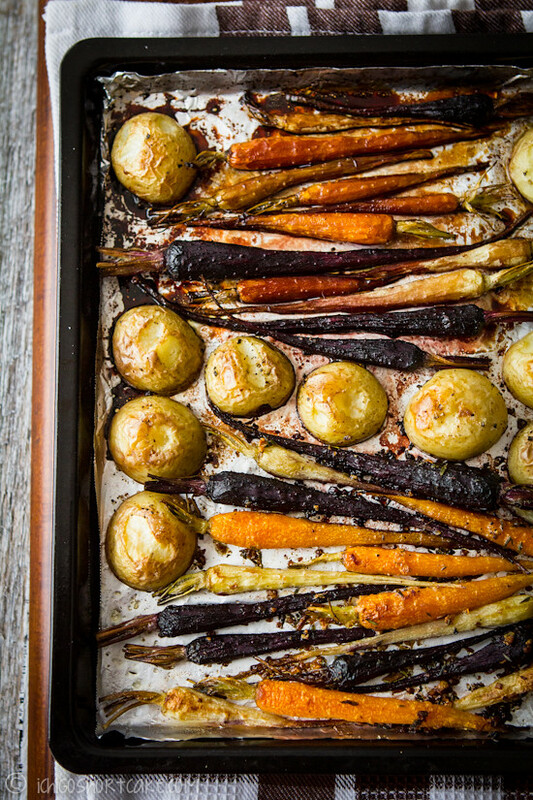 Ooooh I LOOOOOVE maple baked carrots, I normally do them with cinammon and nutmeg! 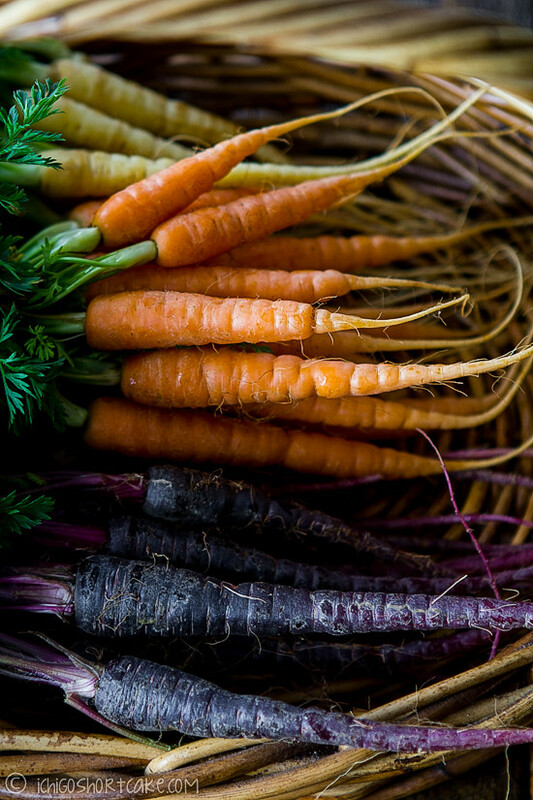 But I also love them raw with some beetroot dip – Carrots are just so versatile! Perfectly lovely :). No other words needed to describe it :). That’s an absolutely perfect way to describe what is happening to my palette. A second puberty. I wouldn’t eat anything before I turned 28…especially not carrots. No veggies, barely any fruit. I lived off bread and mac ‘n cheese. It’s great though that your tongue starts to mature as you age. It’s opened up a whole new culinary world to me. Like baby carrots 🙂 These look absolutely fabulous! 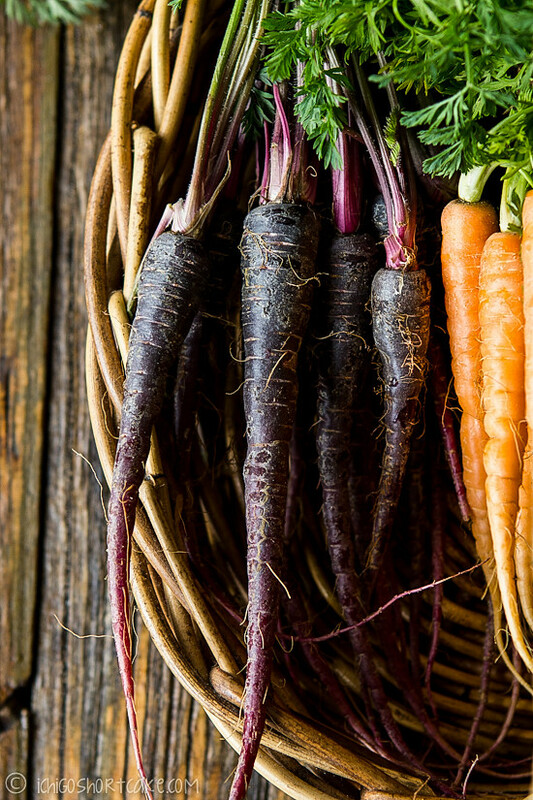 beautiful photos and great ideas for cooking carrots! Oh yum… I have some dutch carrots so tonight I’m making the maple glazed baby carrots:) Thanks for sharing. All your pictures are great, but I particularly like the 2nd and 3rd. And carrots are one of those foods I’ve always liked (always liked beer, too!). I think thyme goes particularly well with carrots, so I’m delighted to see you using it here. Really good post – thanks. Yours look utterly delightful my friend, thank you thank you so much for sharing! Love the photos! Love the recipe. So pretty! I love all three versions. Love the idea and I love dutch carrots! You take such amazing photos! I hated carrots when I was young, and now I can’t get enough of them. 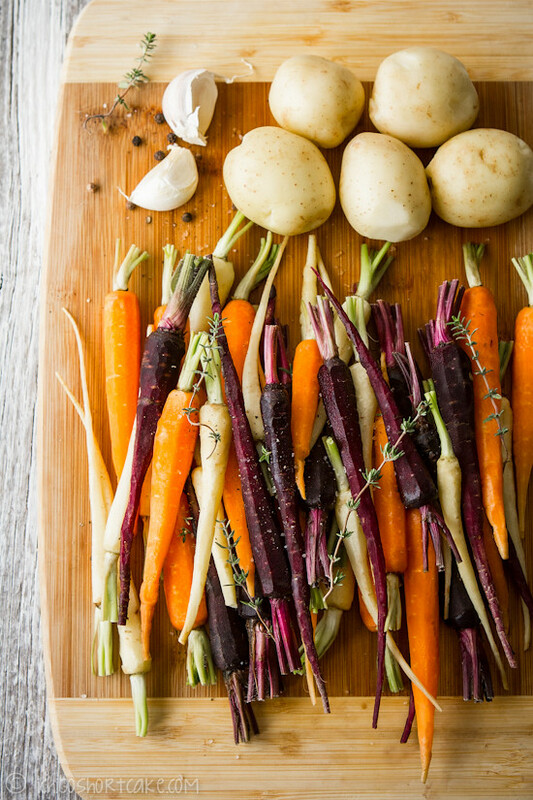 My local supermarket has loads of baby carrots in at the moment, and I’ve been wondering what I could do with them – I’m thinking the garlic, butter and thyme recipe looks like a great place to start! I have a feeling that my kids will happily eat maple syrup glaze carrots. This is a brilliant idea that I’ll surely try. Gorgeous photos Jenny!!! !